Gatlinburg Cabin Rentals, Pigeon Forge Cabins, Sevierville Cabins, Great Smoky Mountain Cabins, all offered here! 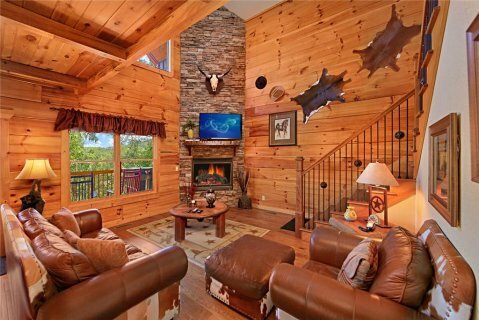 In addition to Gatlinburg Cabin Rentals, we offer an excellent array of Pigeon Forge Cabins and Sevierville Cabins. With Timber Tops you will find over 300 Luxury Log Cabins all in the heart of the Smoky Mountains. Timber Tops Luxury cabin rentals offer top of the line amenities such as hot tubs, Jacuzzis, saunas, spas, private indoor heated pools, pool tables/game rooms, Internet facilities, and an extensive range of entertainment facilities, such as home theater systems, plasma TVs, PlayStation, electronic dartboards, and media rooms.